Every Wednesday during tourist season Ocean City, NJ has face painting, clowns making balloons, crafts and other fun things for the kids to do. Max was a happy princess. Morgan was upset that her balloon fell apart... from a bunny to a snake. Todd and I took a tour of the East Point Light House off the Maurice River during our beach trip to New Jersey. It was partially destoryed in 1971 by a fire, but rebuilt by the historical society. It's charming appeal makes you step back in time and you can imagine yourself there as the oil lamps are being lit to warn incoming ships. Looking out the window you had a beautiful view of the ocean. The smell of the salt water and call of seagulls gave the added appeal to the scene. 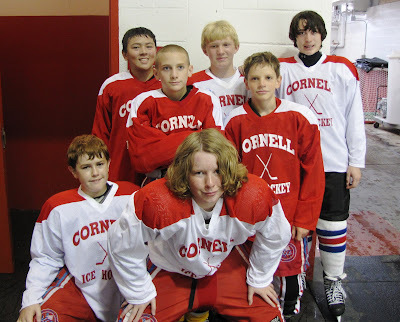 Brandon and a few of his teammates from Valley Forge Colonials spent a week at Cornell University in Ithaca, NY to attend a hockey camp. Brandon was excited to spend five days in a college dorm and eat college food! Heather and I decided to cool off with the zamboni shavings by throwing snowballs.